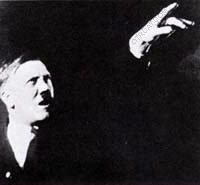 Responsible for the deaths of more than 30 million people, Adolf Hitler is one of the most infamous figures of history. 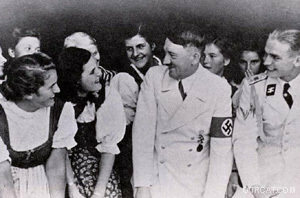 During an economic and social depression in Germany, Hitler rose to power promising "freedom and bread and created the Third Reich under the principles of radical anti-Semitism and racism. A talented speaker, the complex propaganda of the nazi party is considered in part why the nation of Germany was convinced to allow the atrocities of the Holocaust to occur and led the way to the Second World War. These speeches should be regarded and an important part of world history and should remind people of the dangers of militant and uncontrolled political agendas. Completely in German, this collection includes some of his most famous speeches including speeches to the German Youth. There is also an extras folder with extensive graphics, photos, propaganda posters, political cartoons, and research of the Third Reich for historical purposes. For more WWII shows, see also: Dear Adolf, Man Behind the Gun,Soldiers of the Press, Words At War, and You Can't Do Business with Hitler. 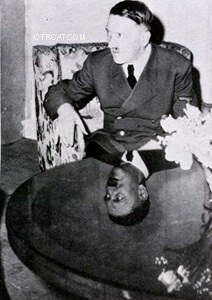 Be the first to comment on "Hitler (Adolf) Recordings"